Entering a Lush store feels like you’ve just floated through the church doors on your wedding day. Adoration, validation, absolute titillation. Employees of the cosmetics brand are the happiest hippies on the high street. Astonishingly, that experiential magic is replicated online. 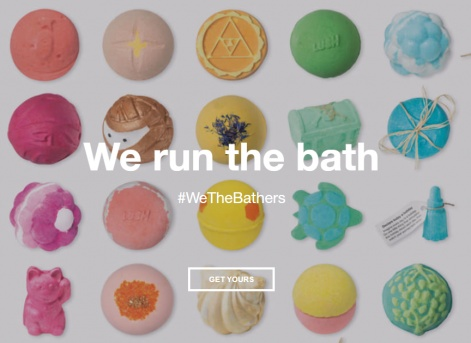 Lush has a social presence like no other. The majority of its influencers are organic and there are even specific strands of beauty bloggers who devote their space entirely to Lush products, like Lulu from Lush Upon A Time. It’s fun, it’s ethical, it’s genderless. It’s 2019 to a tee. Stop and smell the Rose Jam - Lush is one of the most important brands for business owners, marketing professionals and influencers to pay attention to. If you’re lucky enough to find an influencer who is already a brand advocate, you go ahead and jump on that glory truck. Ride it all the way to Instagram discovery town. But make sure you give back. 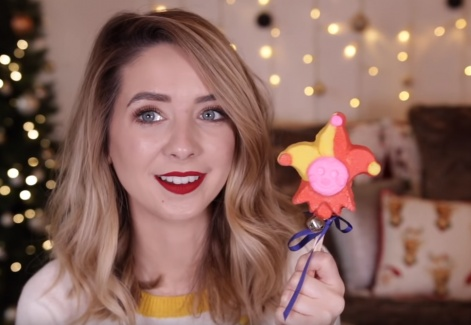 YouTube’s golden girl Zoella has gushed about Lush for years. The brand wisely took advantage of her interest (not to mention her 11m subscribers) and sent her one of every product for Christmas. Rewarding loyal customers and influencers will further cement trust and commitment to your brand. Some of the most successful companies have their own ‘tribes’ - in this case ‘Lushies’ - who make it harder for competition to dent sales. How can your product or service be trumped when it’s already in the minds and hearts of your strong collective? Ever landed upon an Instagram story of a Dragon’s Egg exploding in your mate’s tub? All sherbet lemons and popping candy - it’s serendipitously satisfying and immediately gives you the urge is to go out and buy an entire arsenal of bath bombs. 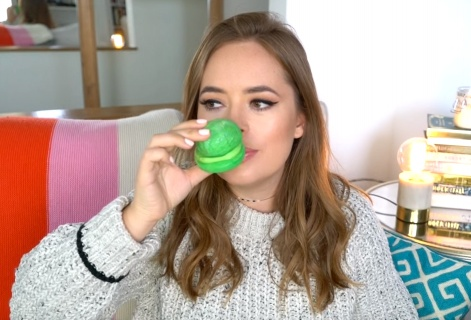 Tanya Burr is another to declare her undying love for Lush and her vlogs dive deep into the descriptive side of things. And it’s so easy to do that with Lush - the colours, textures, smells and oceans of personality make these products some of the easiest in the world to discuss, describe and drool over. If your brand is highly visual, play up to that and appeal to as many senses as you can. 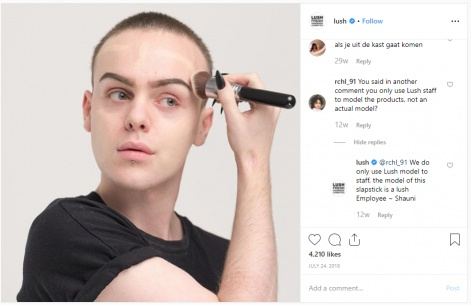 Lush claims it doesn’t have a target demographic and the only models it features are actual Lush staff. Have a scroll down the Instagram page and you’ll see men applying face masks, men soaking in the tub and male couples fresh out the shower. While the majority of Lush customers are women, this genderless marketing makes Lush stores welcoming to all. In 2018, the brand launched a hugely successful #TransRightsAreHumanRights campaign, bringing awareness to an important issue while promoting its gender-fluid products and philosophies. Diversity isn’t just a box you can tick off - this campaign worked for Lush because it lived and breathed the cause. Whether you’re a brand or an influencer, your followers will know if your intentions aren’t organic or honest. It pays to be kind: this guide on charitable influencer strategies should keep you on the right path. While its soaps and scrubs soothe customers’ minds, Youtube is the ylang-ylang Lush’s marketing team crave. But you’ve probably guessed that already. The brand’s products are practically made for the channel - which is handy because videos on social media generate 1200 per cent more shares than copy and images combined. It’s nothing new - we’ve been whooping about the rise of video for years. But with so many new trends to try, it can help to stay rooted in one format you know definitely works in your campaigns first. Not every brand needs to move customers to laughter or tears; some simply need to engage and educate. And some do it all - like Lush. Define your brand’s on-paper personality and make sure it’s consistent across all formats - it’s not always as simple as ‘chatty’ or ‘formal’. Lush posts read like they’ve written themselves, but I can assure you it’s the wizardry of a very clever copywriter. There’s no filler, no waffling - and where words are needed (for example, product descriptions), the copy is clear, crisp and consistent. And somehow, spectacularly, they pull off puns without sounding like your Dad. Bravo, Lushies.